Some 10,000 people took to the streets of Budapest on Monday evening (and up to 5,000 protested in a handful of other Hungarian and European cities) in what was dubbed a “Day of Public Outrage” against the taxes, systemic corruption and anti-western foreign policy of the Orbán government. 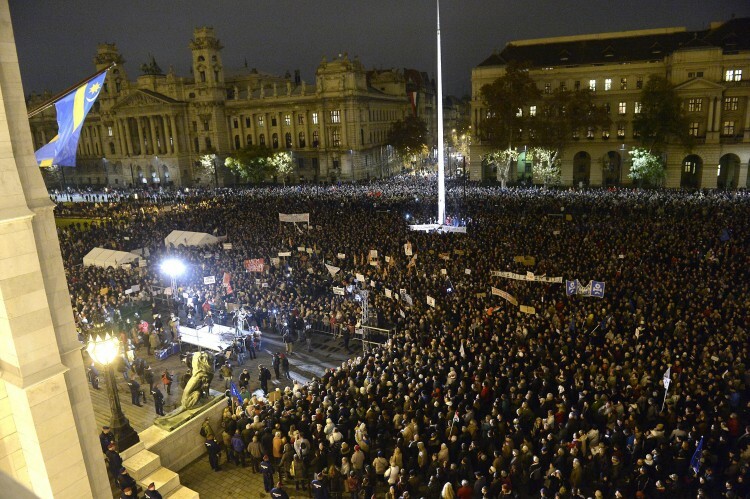 The demonstrators called for nothing short of Prime Minister Viktor Orbán’s resignation. What was most striking in Kossuth Square, where the ten thousand-strong crowd gathered, was the deep sense of anger across a demographically diverse group of protesters and the wide range of issues that convinced students, young professionals, the middle-aged, pensioners and the unemployed to take to the streets. Observers noted that while the Internet protests of late October attracted a younger crowd, yesterday’s demonstration brought out people from all age groups and segments of Hungarian society. And this suggests increasingly widespread alienation and displeasure with the government; it is no longer a specific cohort, a fringe group, a minority or some special interest group that is furious, but people more generally. It was abundantly clear that the protesters were leaderless. 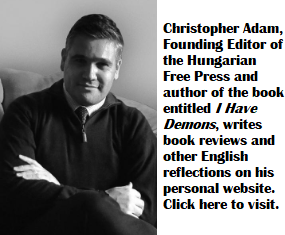 When the circa 60 organizers of the event asked participants to go home (and when a fiery young communist by the name of Ábrahám Soma Kiss encouraged protesters to march with him in downtown Budapest), nearly the entire crowd stood still. The official demonstration had long ended, yet thousands packed the square for hours. The demonstration ended just past 7:00PM local time, but at 10:00PM, there were still nearly three thousand protesters facing off with riot police. They broke through a barrier and headed to the steps of parliament, but after a stand-off that lasted over three hours, the police dispersed what remained of the crowd. Day of Outrage. Photo: Lajos Soós/MTI. The online news site Index.hu noted a real disconnect between the speakers/organizers and the crowd. For instance, while Mr. Soma Kiss showed up in a Soviet-style CCCP t-shirt (which even some of the organizers felt was “a little much”), many in the crowd waved American, EU and Norwegian flags, very clearly suggesting that their main concern was for Hungary to return to the Transatlantic community. That having been said, there was also a handful of red flags and anti-capitalist placards. As well, while some speakers roared a long string of expletives into the microphone (telling where Mr. Orbán and his lot can go), there were quite a number of young parents and with children in the crowd. Mihály Dabóczy, one of the organizers, conceded that many of the speakers were inexperienced, but that this was the plan all along: they wanted to introduce the public to some new people and faces. Mr. Dabóczy described the tone of the crowd as “tense”…most demonstrators had no intention of leaving the square after the protest had formally ended. Day of Outrage. 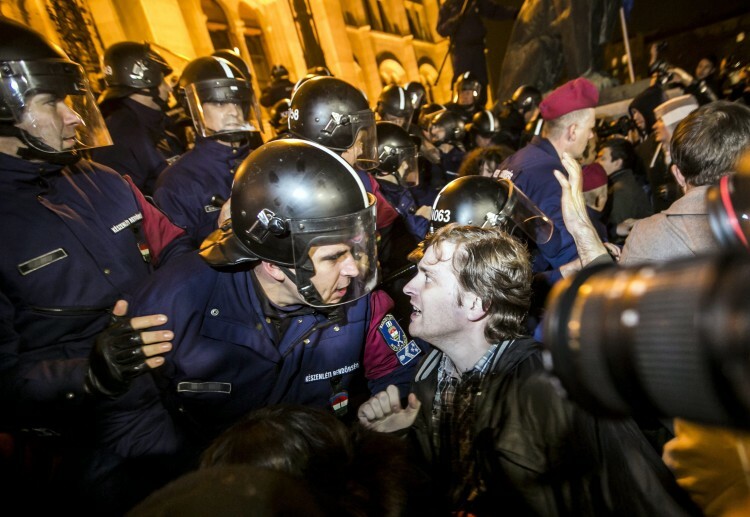 Photo: János Marjai/MTI. What is most instructive about this latest protest, at least to many observers, is the fact that Hungarian society is now moving closer to the boiling point and it is becoming easier to convince relatively large crowds to take to the streets with very little effort, beyond some Facebook organizing. It is also much easier to convince major western media organizations to cover opposition events. The detailed report in the BBC is a good example. While for much of the last four and a half years, only the most politically active and largely disconnected ‘niches’ in society were engaged in protest, the general population now seems to be tuning in. And, critically, it is easier than ever before to ensure that the international media hears their voice. That voice, as well, is becoming more forceful and more radical in its demands.